Off road biking tour through the Khustai Nuruu and Khangai Nuruu national parks, two of the most beautiful landscapes of Mongolia. In the morning arrival at Chinggis Khan Airport in Ulaanbaatar, transfer to the hotel, after breakfast short break, city tour including Gandan Monastery and the National Museum of Mongolia. After lunch we will visit the Choijin Lama Temple Museum, dinner at the hotel. In the morning we drive to Khustai Nuruu National Park, there is a project for reintroducing the “Przewalski Wild Horse” (called “Takhi“ by Mongolians) back to their native land. 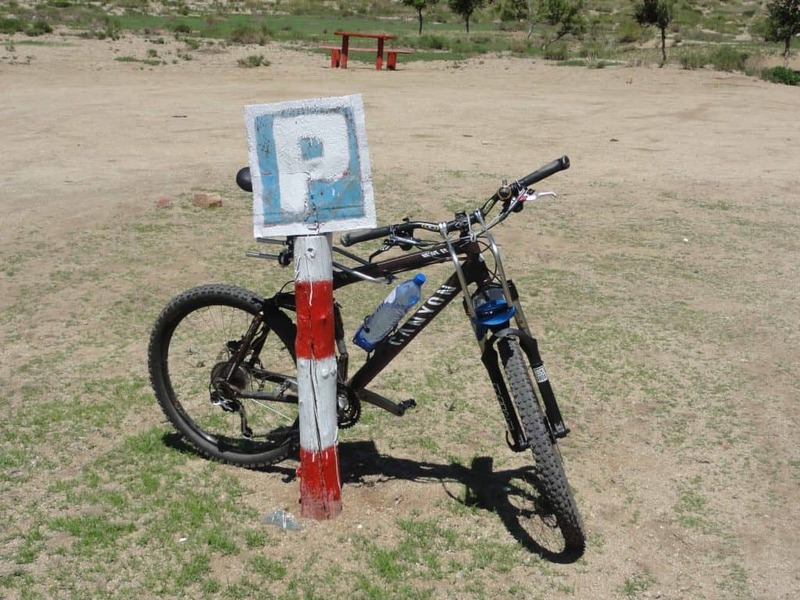 We will bike from the parks research center via the water place of Takhis to our ger camp, managed by nomads (approx. 25 km). First night in a Mongolian ger. Today we will have biking day to the deer stone from the Bronze Age, furthermore we bike to the Turkish monument of the 6th-8th Century (approx. 30 km). Drive in west direction to the sand dune of Elsen Tasarkhai and to the Nature Reserve Khugnu Khan. In the afternoon arrival at ger camp in the valley of the mountains Khugnu Khan, where we bike to the temple Uvgunt (approx. 30 km). First drive to the temple Schankh of the 17th century. Afterward we will bike to the beautiful and largest waterfall Ulaanzutgalan (approx. 40 km), on the way stay overnight in tent. Continue our tour by our bus-jeep to the national park Khangai Nuruu, in the afternoon we will bike from the stones of Hun period to the waterfall (approx. 30 km) and stay overnight in extra ger managed by nomads for tourists. Today we bike to yak breeding nomads, where we learn about their daily life and taste yak milk products (approx. 40 km), stay overnight in extra ger. We bike to the temple Tuvkhun, World Heritage Site (approx. 30 km). The temple is located 2300m high on mountain peak with a magnificent panoramic view. Stay overnight in tent surrounded by the beautiful landscape. 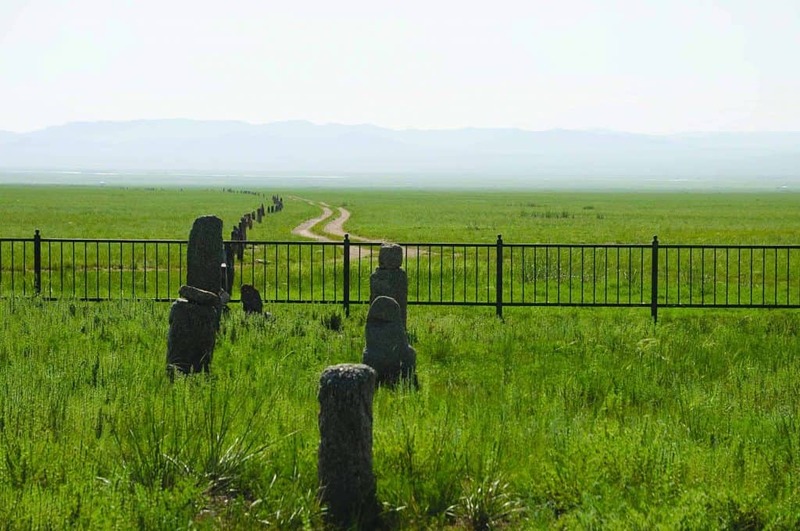 We bike to the Orkhon Valley to the ancient capital Kharkhorin. On the way we pass the hot spring Jaran Raschaan (approx. 25 km). Stay overnight at ger camp. Morning drive to Erdene Zuu, World Heritage Site, in Kharkhorin, visiting the monastery, in the afternoon we cycle via asphalt road north to the memorial site of the Turkish Empire from the 8th century at Khushuu Zaidam (approx. 40 km), stay overnight in tent. After a distance (approx. 40 km), we reach the lake Ugii. In the afternoon we have free time at the lake, stay overnight at ger camp. 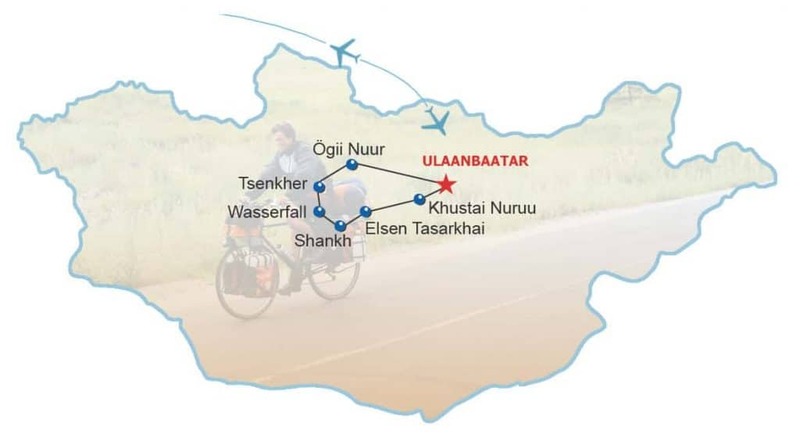 Today we cycle toward Ulaanbaatar (approx. 40 km) and in the afternoon drive to the monastery ruins of Khar Bukhiin Balgas from the 17th century, stay overnight at ger camp. In the morning we will drive back to Ulaanbaatar, in the afternoon we will have free time for shopping and sightseeing in the city and in the evening farewell dinner with folklore. Stay overnight at hotel. Transfers, English speaking guide, 13 nights: 2x in hotel, 8x in ger camps, 3x in tents, full board.